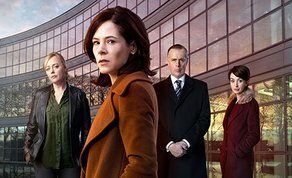 IFTN caught up with actress Elaine Cassidy to talk about her new drama series, 'Acceptable Risk' in which she plays the lead 'Sarah Manning'. The series, produced for RTÉ by Siobhan Burke and Kathryn Lennon (Saffron Pictures) and James Mitchell (Soho Moon Pictures), is directed by Kenny Glenaan and written by Ron Hutchinson. It airs for six weeks from this Sunday, 24th September on RTÉ One at 9.30pm. IFTN: "Elaine, you have primarily worked abroad for the past number of years. What was it like filming back in Ireland?" ELAINE: "It had been a long time, it had been nearly 10 years since I shot here! I was doing 'Little White Lie' with Andrew Scott and it was REALLY low budget, really off the cuff filmmaking but even then, the on-set etiquette is just there. It's a discipline, an invisible discipline, that just exists and then again at a drop of a hat it’s having the craic, but it’s as if the crew senses 'oh maybe this is a sensitive/difficult scene' and they, without being told, will work quietly. It's a sensing thing, and they are amazing, they are top of their game because they are working so much. “Shooting in Ireland meant I also got to spend loads of time with my mom! Usually when I see my mom, my kids are there so the focus is on the kids, whereas this time I actually got to see my mom; I got to see her and have a relationship again, and bond again. So that was really special, that was really important I think." IFTN: Yes, Irish crews have a great international reputation – why is filming with an Irish Crew so enjoyable. Elaine: "All the crews that I have worked with are brilliant, really professional, and really good at their jobs. But, Irish crews just have such brilliant on set etiquette, balanced with humour. "Coming back this time actually reminded me of what I felt while filming 'Little White Lies'. There is no hierarchy, which seems like an oxymoron but every one knows their place. So yes, there is a hierarchy but there is no class system and it is a team. Nobody is more important than another and it’s just really, really lovely. It's something that makes me feel really proud about being Irish. It’s a lovely balance that is just organically there. "Also Tim Fleming (DOP), he is brilliant, I didn't fully know how brilliant until after watching it, but I felt he was brilliant on set, he is very intuitive with Actors and discrete but supportive of actors, and also being able to frame things brilliantly in a very cinematic way. So my instincts were right - I was surrounded by good people!" IFTN: You have a lot of drama credits under your belt, including 'No Offence’, 'The Paradise,' and 'Harper's Island,' so what attracted you to the role of Sarah in 'Acceptable Risk'? Elaine: "Well, What was really attractive was that the full 6 episodes were written. That might seem weird but it’s the way things used to be, and it doesn’t happen that way now. Having those 6 episodes was excellent because you can see the overall journey and you can sort of plot or map key points while still being organic. “You generally will block shoot two episodes at a time, which actually in a way makes it easier because you are only ever holding two scripts in your head at any one time. Then you don't have to remember them so you can move on from those onto the next two scripts but with this [Acceptable Risk], it was very difficult because you had to have 6 hours in your head and there are a lot of things going on. So for example, if in one day you are doing a scene from each of the 6 episodes, you have to remember where your character is mentally at in each scene." IFTN: And working with Ken Glenaan, the director? Elaine: "It's a very challenging part because you are quite exposed as an actor playing something like that and if you are not supported by the filmmaker, you are f**ked! "You know you are at their mercy so you need to have that support. I had worked with Kenny Glenaan before [The Paradise], for the BBC, and he is incredible, I love him as a director and I 100% trust him. I knew it would be really enjoyable with him, and I wasn’t wrong! And I knew I could trust him and I knew I'd be safe." IFTN: "Finally, without giving too much away, can you give us any sort of indication to the character ark that may be in store for Sarah Manning?" Elaine: "Well, I think what you see in episode 1, I think you see the fire that’s been ignited in her [Sarah] to find out the truth. She's always had that in her, she’s a bit of a workaholic but for the first time in a long time you see in the beginning of episode 1 that she is in a really happy place, personally. "I guess what the audience should be asking themselves is 'what is it going to cost her?' And you will learn how far she is willing to go for answers. Life is a bit like bartering isn't it, what are you going to give away in exchange for what you want to get." 'Acceptable Risk' is produced for RTÉ by Siobhan Burke and Kathryn Lennon (Saffron Pictures) and James Mitchell (Soho Moon Pictures), is directed by Kenny Glenaan and written by Ron Hutchinson. It airs for six weeks from this Sunday, 24th September on RTÉ One at 9.30pm.